Yesterday this blog took us to the depths of space to explore the frozen ice-moon of Triton. Today we atone for that cold voyage with a trip to the inviting tropical seas of the Indo-Pacific. In these vibrant waters can be found one of the greatest living gastropods, a prince among predatory sea snails, the mighty Charonia tritonis, (commonly known as the giant triton or Triton’s trumpet). 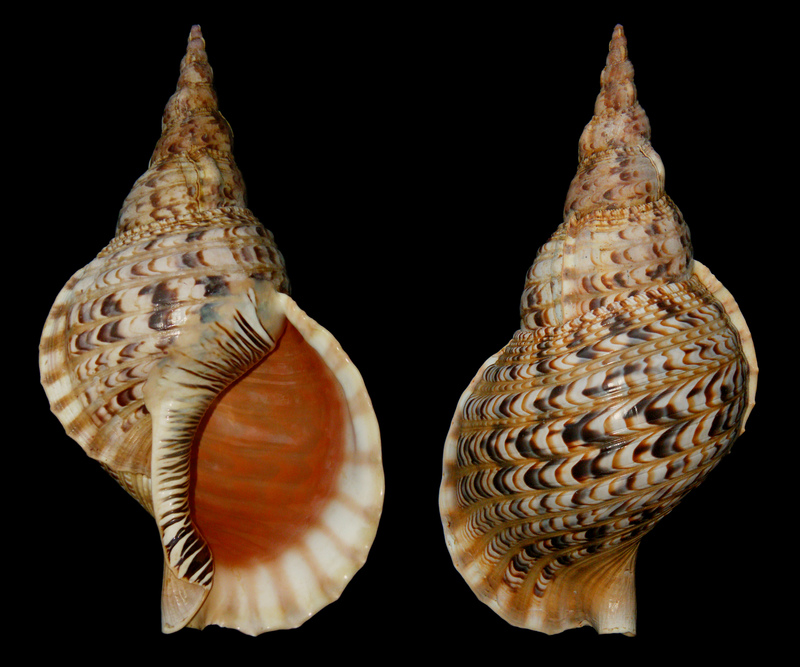 Charonia tritonis grows to over half a meter (20 inches) in length: it is one of the largest living snails in the world (and it is not much smaller than the biggest extant snails). Equipped with a powerful muscular foot, acute senses (particularly smell), and an agile tentacle-like proboscis, the snails are formidable hunters. 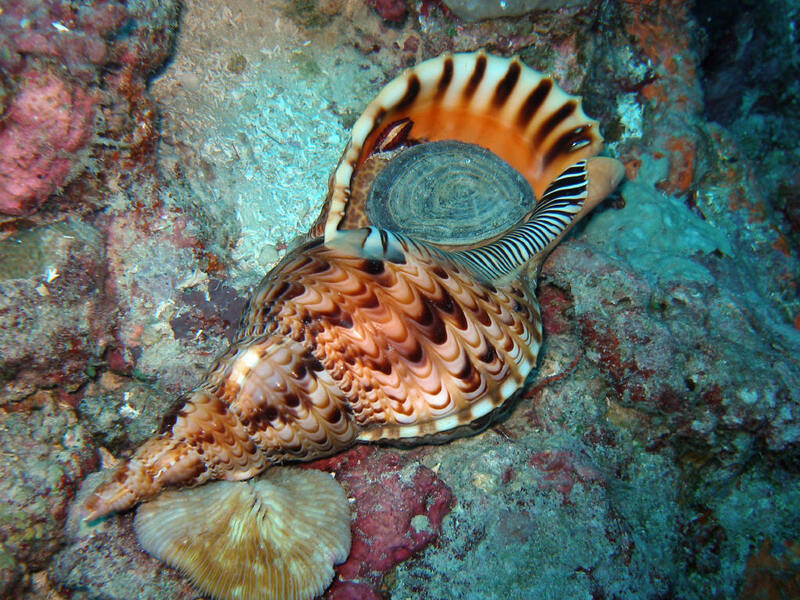 Additionally they are protected from predators—even big fierce ones–by their beautiful spiral shells which are vibrantly colored orange, brown, yellow, and cream. Of course such a shell would become a liability for the snail if an animal ever evolved which killed the snails in order to harvest the magnificent shells solely for their beauty (but what are the chances of that?). Giant tritons hunt at night. Their main prey are echinoderms—starfish, which can be large powerful and armored. Fortunately the snails are not just equipped with powerful muscles and superior brains. 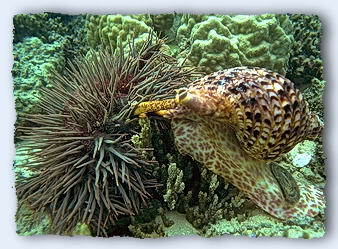 They also have salivary glands that produce sulfuric acid AND a chemical which paralyzes starfish. The tritons find starfish—even big spiny poisonous starfish like the invasive and all-consuming crown-of-thorns which bedevils the reefs of the Indo-Pacific—then hold them down and inject saliva into them. As the starfish dissolves from within, the snails rip them apart and feast! Tritons have a specific gender—they are male or female. They seek each other out for courtship and the female then lays a large clutch of eggs. When the eggs hatch, the young snails become part of the oceanic plankton for a (poorly understood) time before developing into adults. 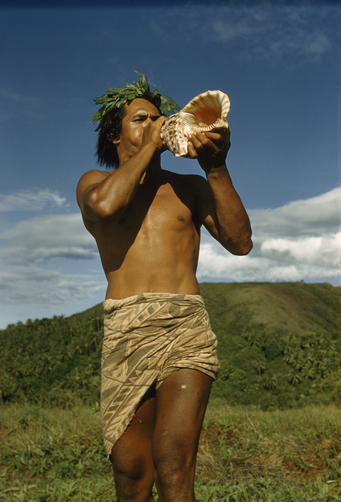 Triton shells are esteemed by many cultures as sacred musical instruments. The shells themselves are collector’s items and are arguably better known then the formidable long-lived predators which make them. 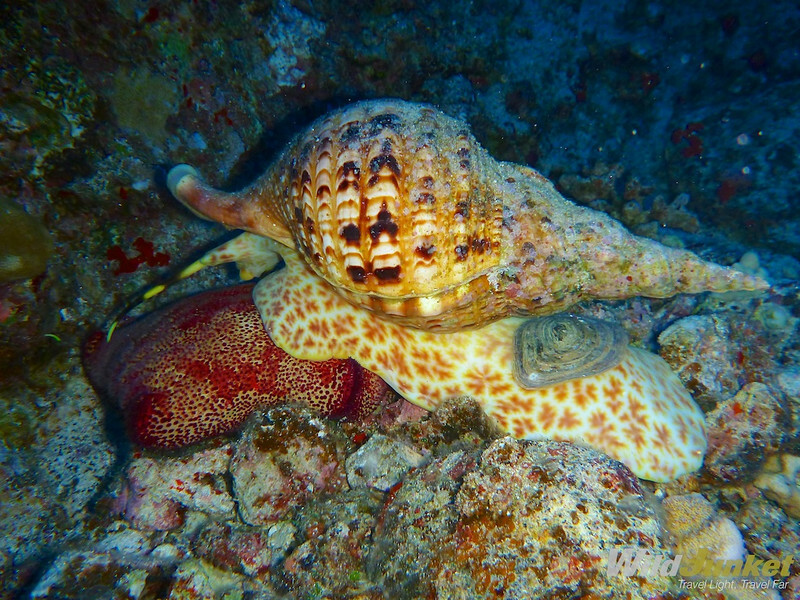 Although the snails are not threatened with extinction as such, there are fewer and fewer really big adult ones (or even small ones) on today’s reefs. This is a real shame, since those same reefs are being devoured by the horrible crown-of-thorns. Hopefully a new generation of divers and wildlife enthusiasts will appreciate the triton on the reef and leave them to their invaluable hunting. Resist the urge to buy the beautiful shells and help save the reefs of the Indo Pacific!